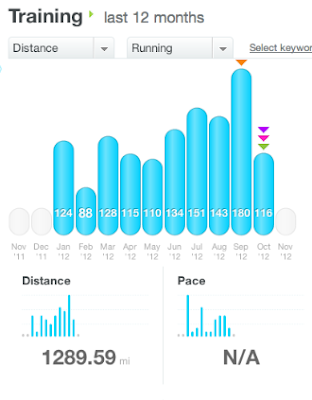 Running Mileage - 116 whopping miles - looks really pathetic next to that 180 miles for September. But still - 116 is still great for me! There was a marathon in there and taper, and rest after marathon. So, looking at those factors, I'm happy. Yearly Mileage - 1289 miles as of October 31st, but I've done 18 more miles since that screen shot - which means my yearly mileage is 1307. Last year's mileage - 1300. I guess I'm done running for the year. So, what are my goals for the remainder of 2012? - Speed work - I really want to run a sub 4 hour marathon - so speed work it is. - Strengthen my core - I'm not impressed with my abs. Meaning - I know they are there, somewhere. - Build my base before marathon training kicks off in January. Right now I'm happy with anything over 30 miles a week. My goal is to get up to 40 miles comfortably. I just need to really work on fitting it into my schedule. I have tons of meetings coming up in the next few months and some major life changes - so I'm hoping it works out. - Mileage? - Hmmm.....do I see a 1600 miles in my future? I wonder where Ward is in his mileage. Last time I checked with him he was crushing me. What are your goals for the rest of 2012? Do you track your mileage? Where are you? I haven't got my totals for the year yet, but I think I'm lower than my pretty unrealistic goal of 1000 miles. When did I ever think I was going to run over 100 miles a month?? lol Great job on your totals though! My goals are very similiar to yours but injuries have kept me back this year :( My goal was 1200 miles for the year and I barely at 800 so I am hoping to still get 1200 miles in. I also track my miles on dailymile. My biggest goal is to run a sub four marathon and I am about 5 minutes off! Looks like you had a great year! Awesome mileage! I want to hit 1,000 this year and I'm on track to do it as long as I don't let things slide too much after my race on Sunday. My mileage has been way down lately but I am okay with that, I have no big races until next year, in fact I have 17 weeks until my next half marathon, so I am planning to pick up some speedwork in another month, but until then it is all about maintaining a solid base. Great job with your October and overall mielage! I'm with you on the abs, that's on the top of my workout plan once the marathon is over. Congratulations on running so many miles so far this year. You are nothing short of impressive! I need to do some hill work!